Now that we've taken a look at the new Commanders for Wave 3, let's take a quick peak at the officers that will be accompanying specific ships into battle. 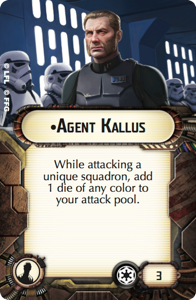 Agent Kallus - 3 points - "While attacking a unique squadron, add 1 die of any color to your attack pool." Now there is an interesting conundrum. Kallus obviously belongs on a ship that will be firing at squadrons regularly, making him a good fit to a Raider I-Class running close quarters support, or boosting a Gonzati to a respectable anti-squadron fire capability. He does trigger multiple times, so if you can double arc an enemy named squadron, you can really put a lot of fire into them. He may even find a home on a GSD2 or ISD with Gunnery Teams to help with point defense against enemy bombers. But what to throw at the enemy? It is an "add" effect, so it doesn't go into your anti-squadron battery itself, it is added on after your roll, so you actually have a lot of leeway in choosing what sort of shot you want to take. You can even use this add much the same way as a Paragon or Defiance, and add another die of the same color from a Concentrate Fire following your roll. Blue - 50% hit / 25% acc / 25% "miss"
Black - 75% "hit" / 25% "miss"
Red - 12.5% double hit / 25% hit / 12.5% acc / 50% "miss"
Blue gives the best chance of an accuracy at a still wimpy 25%, while Black is the best chance to get a "hit" in general. Red is an interesting option, because it is the only one with a Double Hit result, but most unique enemy squadrons will have a Brace to limit the effectiveness of this. It may only be useful to try for if the enemy has double braces, and you didn't manage a single accuracy, and rolled an odd number of damage already. A thought though - Red dice would work with Point Defense Reroute to reroll half of the "miss" results, and would also be spin-able to double hit with Turbolaser Reroute Circuit - though currently there is no Imperial ship that can take both Kallus and have an evade to use with Turbolaser Reroute Circuit - something to keep in mind for possible Wave 4 shenanigans I suppose. Black dice could be rerolled with Ordinance Experts, and Blue dice could be spent to reroll other dice with Leading Shots. In the end, he's cheap, but not guaranteed to be a useful upgrade against any given list. Might be good as an insurance buy for a fighter light list. Toryn Farr - 7 points - "While another friendly ship or squadron at distance 1-3 is attacking, it may reroll 1 blue die." This is a very nice upgrade, particularly for squadrons. Unfortunately, it looks like for ships, she only gives the blue die on one of your two attacks, as you are in the "attacking" step of your ship activation for both attacks. It doesn't even work on the ship itself that has her onboard. That's not to say being able to go fishing for a critical / accuracy result on a Blue die isn't useful though. However, for a large number of squadrons, she can add quite a bit of firepower to your forces. Consider her with a Jamming Field, giving X-Wings a better defense while rerolling their obstructed die - effectively giving them the same firepower. She works well also with Bombers such as the B-Wing or Scurrg who want extra insurance for their Blue die to hit, and is practically made for Nym. Even A-Wings and YT-1300s get some bonus to their Counter keyword when she is around. Perhapse a few too many points to just chuck onto a transport that needs to run towards the fight, she might do better on a AFII with the Gallant Haven title. All in all, she will be very good for squadron combat, though shoehorning her into a ship re-roll doesn't feel worth the 7 point cost. Did you know my better half writes a blog as well? Hop on over to Casual Flyday for reviews of board games from the perspective of a casual gamer. Enjoy cruising around the galaxy, in a rusted hunk of junk that can barely fly? Like watching your friend's ship break in two as they pull out of dry dock and watch them try to figure out which section can still fly? Check out her review of Galaxy Trucker! 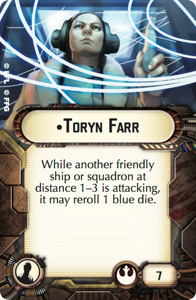 Toryn Farr could also be useful for Ion Cannon based effects, giving a greater chance of getting off NK7s or Ion Cannons. Personally, I think she will work nicely to complement a flak platform - having a reroll on 2 blue anti-squadron dice would be pretty nasty against a TIE swarm.